A duet is a musical composition or piece for two performers. Duets: The Final Chapter, a 2005 album by The Notorious B.I.G. Duets is a compilation of duets by country music artist Emmylou Harris in partnership with other well-known country and rock artists. Most of the twelve tracks on the album originally appeared as singles or on albums released by her singing partners. Several of the tracks attained positions on the Billboard Hot Country Singles charts: "That Lovin' You Feelin' Again" with Roy Orbison was at #6 in 1980; "If I Needed You" with Don Williams at #3 in 1981; "Wild Montana Skies" with John Denver at #14 in 1983; "Thing About You" with Southern Pacific at #14 in 1985; and "We Believe in Happy Endings" with Earl Thomas Conley at #1 in 1988. Also included is "Love Hurts", an early duet with Gram Parsons from his Grievous Angel album. Duets rose to #24 on the country albums chart in 1990. Reba: Duets is the twenty fourth studio album by American country music artist, Reba McEntire. The album was released September 18, 2007 on MCA Nashville Records and September 24, 2007 on Humphead Records in the UK, and was produced by Tony Brown, Dann Huff, McEntire, and Justin Timberlake. 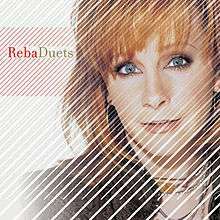 Reba: Duets was McEntire's second album to appear in the new millennium decade and one of her most successful crossover albums,as it is her first studio album to chart in Australia and her 3rd to chart in the UK. It was her first album to peak at #1 on the Billboard 200, while also reaching #1 on the Top Country Albums chart, and was also her final release for the MCA Nashville label. The album featured collaborations from eleven different artists in the genres of Country, Pop, and Rock. The album debuted at #1 on the Billboard Top Country Albums chart and the Billboard Top 200 Albums chart with sales of 300,000. Reba: Duets was recorded at Starstruck Studios in Nashville, Tennessee. Allmusic reviewer, Thom Jurek considered that the quality of the album's tracks was different from that of most other collaboration projects, calling it a "mixed bag" of material. The first collaborator on the album was LeAnn Rimes, who recorded the track, "When You Love Someone Like That" which also appeared on LeAnn Rimes's Family album that same year. Jurek called the duet between the pair "stellar," while about.com called the pairing "an undeniable outcome of perfection. Reba's strong country voice with LeAnn's young, soulful sound created a new sound like no other." The hosts will individually travel across America looking for undiscovered talent. Ultimately, each star will choose two singers to be his/her duet partners. Together the mentors and their protégés will take the stage each week and perform in front of a live studio audience. In the end, one of the pairs will win, with the amateur getting a recording contract with Hollywood Records. Frank: Could you possibly care? Both: That we could share! Frank: Yes, I have got a crush, my Barbra, on you! Barbra: You will make me blush, Francis!